BlackBerry's much-anticipated Priv Android slider smartphone is now up for pre-orders at $699 (roughly Rs. 45,500), and is slated to begin shipping in the US starting November 6. Ahead of the release, some highlight features of the Priv are making it to the Internet and the latest in the series is the handset's 'Productivity Edge' or notifications on the curved edge display. In the meanwhile, BlackBerry has released Priv-specific Android apps to the Google Play store. These include MicrosoftexFAT, Notes, BlackBerry Calendar, Contacts, BlackBerry Hub, BlackBerry Keyboard, BlackBerry Services, Tasks, BlackBerry Device Search, BlackBerry Password Keeper, BlackBerry Launcher, BlackBerry Camera, and DTEK. Some of the apps are brand new, while others have been updated. The apps listings were first spotted by BlackBerry Central. Also new, is the release of the BlackBerry Content Transfer app for BlackBerry Priv users, available on BlackBerry World. The Content Transfer for BlackBerry app will allow users to switch to the new Priv by moving data that is saved on an old BlackBerry 10 device (running 10.2.1 and later). "Data that is associated with a web-based account, such as contacts and calendar events, is transferred when you add the account to your new device. Your data can be transferred with password-protected encryption using Google Drive, your media card, or a private Wi-Fi network," explains the app listing in the Store. BlackBerry previously revealed updates for its device roadmap for the year which primarily included Priv Android smartphone. Notably, BlackBerry has been pitching its first Android smartphone as a flagship slider device. Getting back to the leaked Productivity Edge, to recall, the BlackBerry Priv sports a 5.4-inch Oled QHD (2560 x 1440) display with curved edges, something we have already seen on the Samsung Galaxy S6 Edge and Galaxy S6 Edge+. However, the Canadian company has so far not detailed the function of the Priv's curved edges. A Crackberry Forum member however, has shared images from a Priv simulator, hinting at several unannounced features. In one of the slides, the Priv's 'Productivity Edge' has been detailed and shows how users can select an icon to view app preview. The slider reads, "Tap the Home icon. Drag out the Productivity Edge tab. Select an icon to view an app view. Select another icon to view an app preview. Tap the Settings icon." 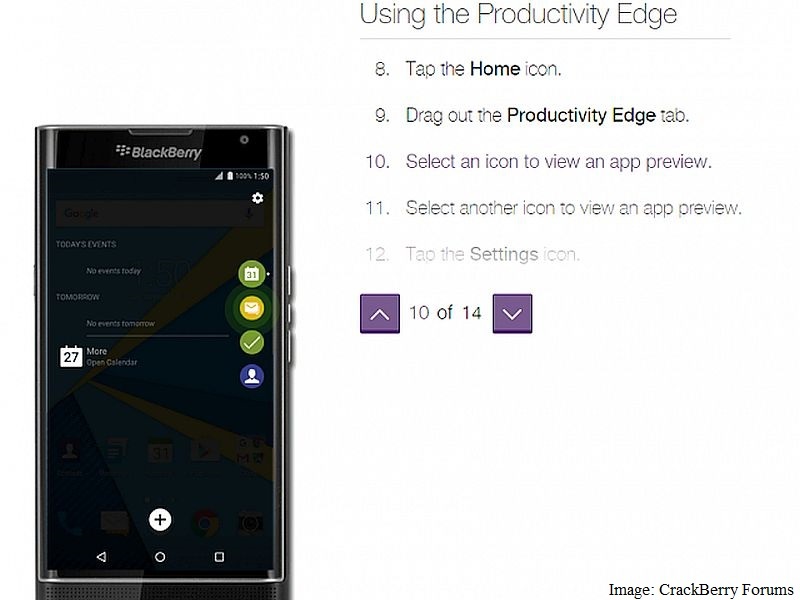 In the leaked slider, an image of Productivity Edge on the Priv can be seen with icons for quick viewing calendar, mails, tasks, and contacts. BlackBerry's 'Productivity Edge' sounds similar to Samsung's People Edge, which majorly allows user to quickly access select contacts. Samsung also includes an option to light up the edge screen when mails, messages, or calls arrive. Another leaked slider shows 'Pop-up widgets' feature which appears when swiping an icon. We can expect the company to detail the functions at the release of the handset.